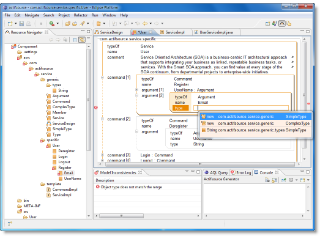 The Actifsource Workbench is a comprehensive design and code generator tool, covering domain-driven software development from domain analysis through to the design models, code generating, testing, refactoring and maintenance. 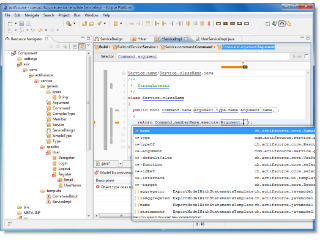 The Actifsource Workbench is a multi-user, Eclipse-based, graphical tool designed to help you build robust and maintainable software. 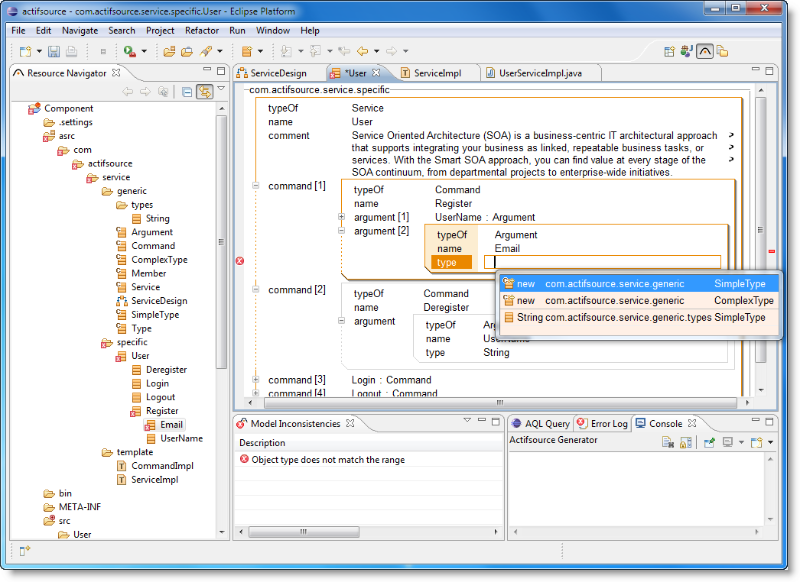 The Actifsource Workbench provides a sophisticated multi-model support. Start with small models in your existing project and evolve by connecting them step-by-step. Introduce model-driven software development in your project today with minimum risk and immediate benefit. Thanks to the ground-breaking Actifsource core technology, you can keep your meta-models and all their model instances in the same workspace. 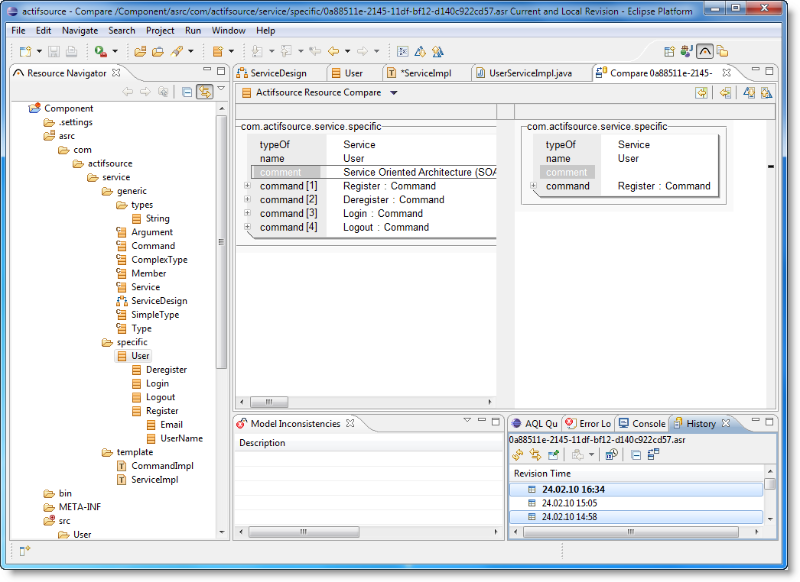 No need to switch workspaces or spawn extra Eclipse instances. 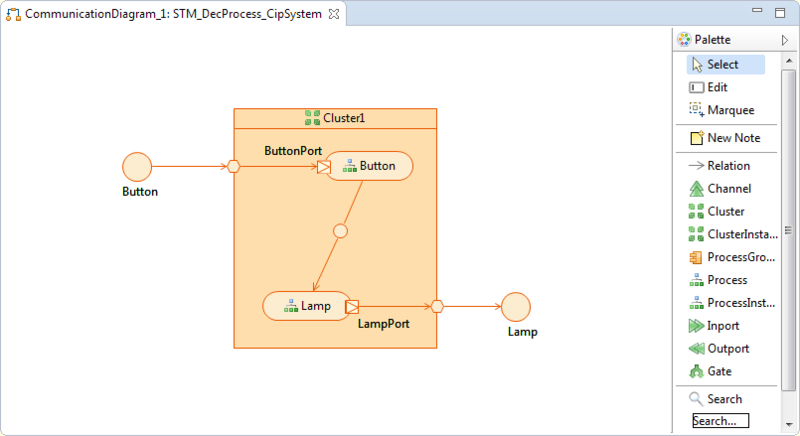 This not only saves you time but it also lets you change your meta-models and keep all depending models in synch. For the first time ever, you will be able to change meta-models safely without risking inconsistencies that break all existing model usages. 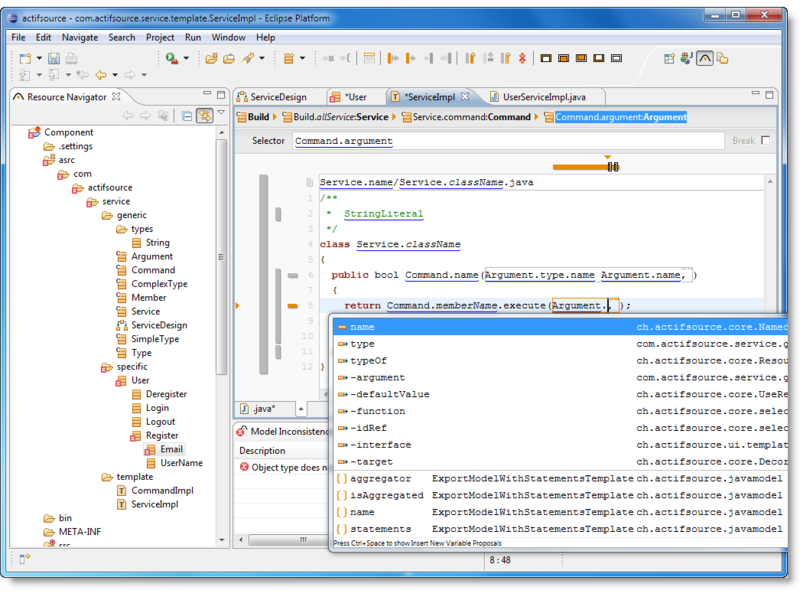 With Actifsource, you always get full support for strong typing and complete symbolic integration across models and generator-templates. 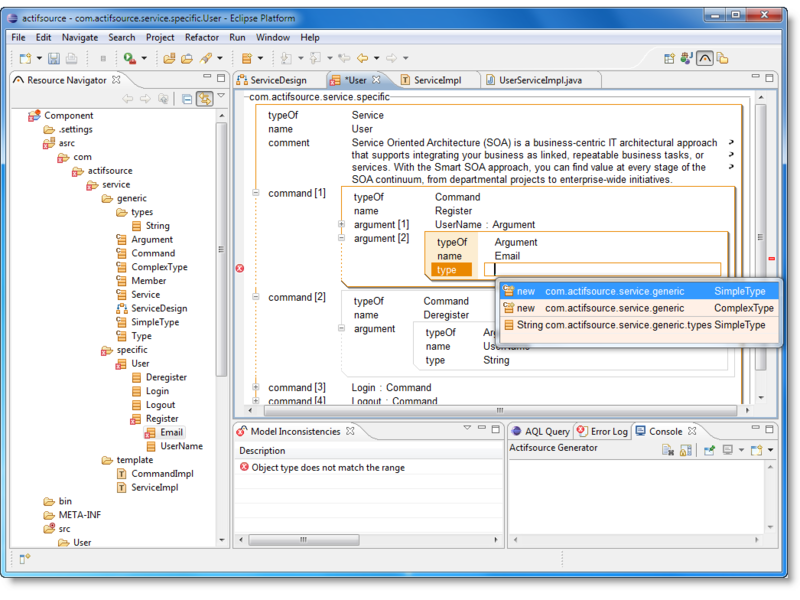 Actifsource offers you smart content-assist that lets you browse and navigate all models, their types, and instances. Make CTRL-SPACE your friend and be amazed about the power and ease of use with seamless symbolic integration. 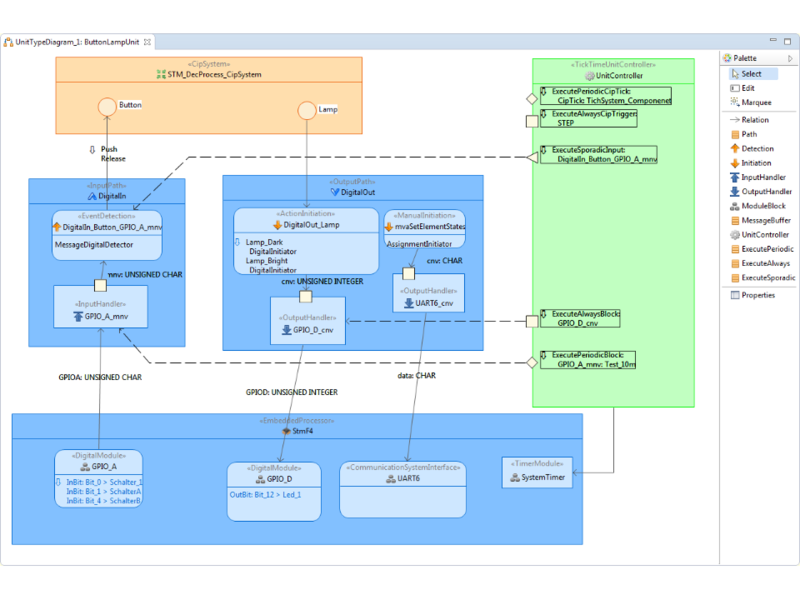 While working on your models and generator templates, you can rely on real-time validation: Explore, validate, and change models and generator templates as you see fit without risking inconsistencies. Actifsource constantly monitors all data input checks it against the type-system of your (meta-) models. This is just another benefit offered by symbolic integration that goes way beyond traditional approaches that often use string-based symbolic references. Explore your models and code; browse your implementations and see what concepts from your initial models they are based on. Actifsource let's you model your business-specific graphical editors which fit exactly your needs. 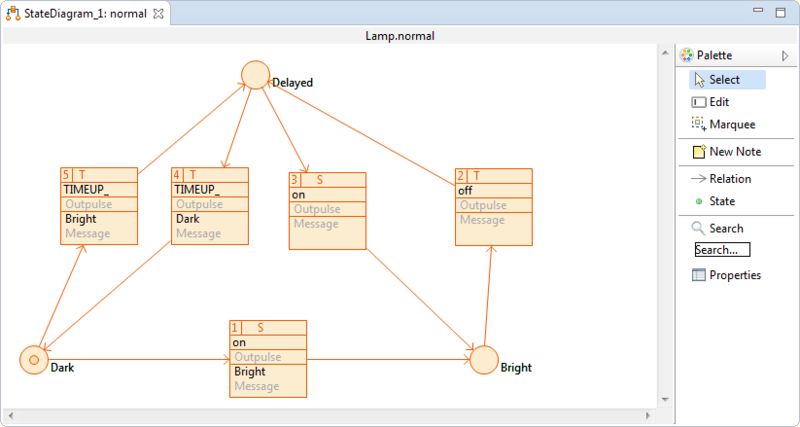 Enjoy the freedom of introducing your type of diagrams now matter how complex they are. 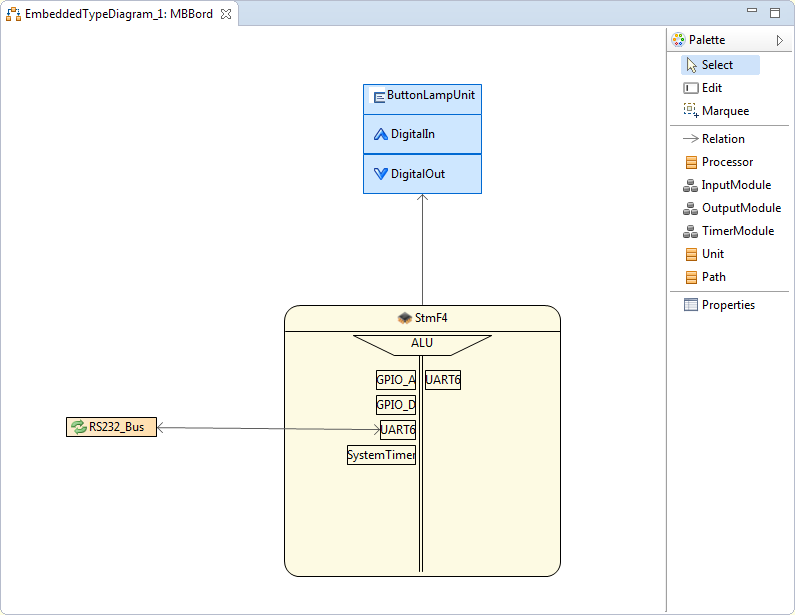 Stop working with graphical standard tools which do not support the semantics of your diagrams. 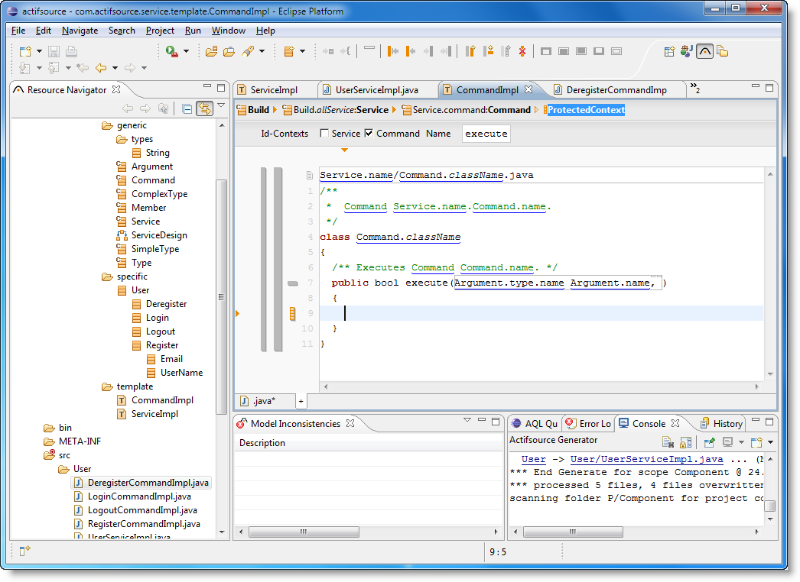 Design your systems in Actifsource and generate code accordingly. Use your favorite Version-Control System (i.e. 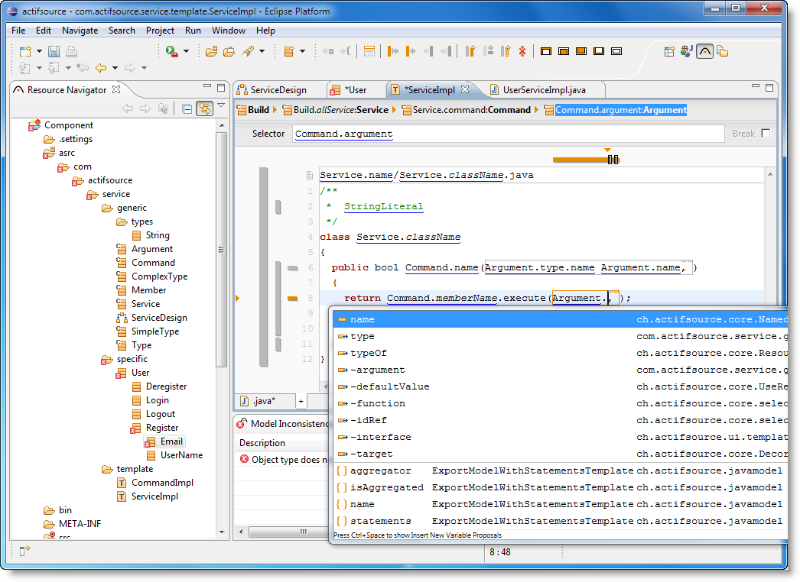 SVN, GIT, CVS, JAZZ and many more) to manage models and generator-templates. Distributed teams as well as off- and near-shore projects profit alike from the sophisticated VCS-support offered by Actifsource through its advanced conflict resolution mechanisms for models and generator templates. Actifsource uses a simple and straight-forward file-based approach to maintain your models and generator templates. While other systems bury your models and templates in proprietary databases, actifsource uses plain text files to store all its information. 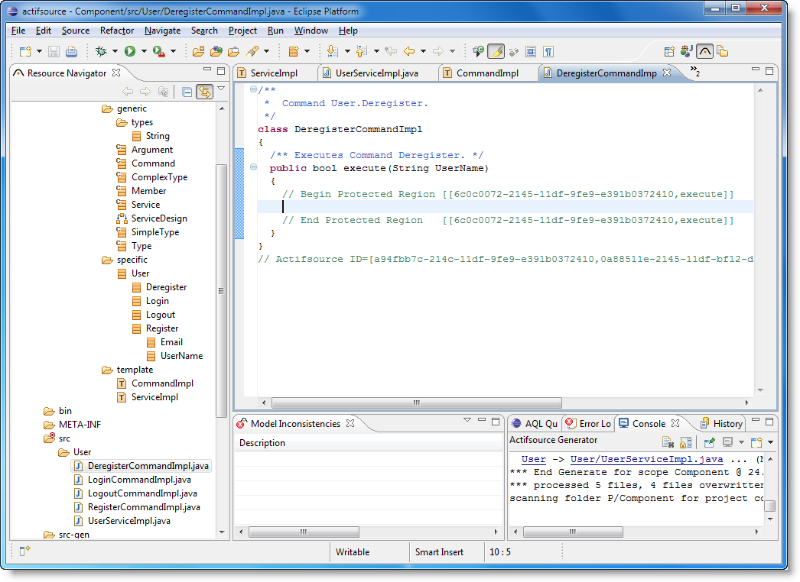 This allows you to use existing VCS to manage all the necessary artifacts, supporting fast update and commit cycles with complete diff/merge support you have come to appreciate in modern IDE-based development. Please consult the Team Support tutorial. Actifsource offers a whole new approach to template-based code-generation that allows you to write code-templates without the need for a special template language. In fact, you can write clean, crystal-clear templates that do not contain a single generator keyword. This not only makes writing templates easy and straightforward, it also improves drastically on the readability of your templates. 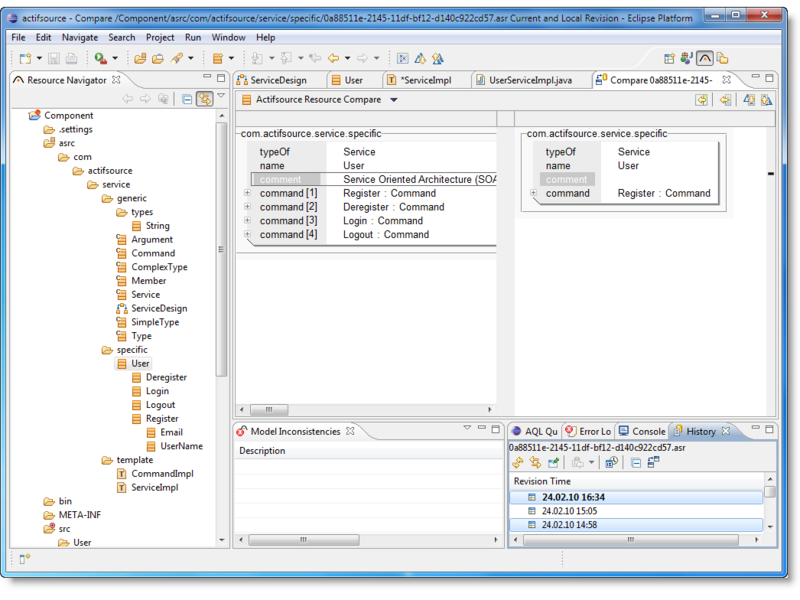 With Actifsource code generation is a breeze: Feel the power of complete and unprecedented symbolic integration across all the models in your workspace: browse, filter, and select types and instances as you see fit. 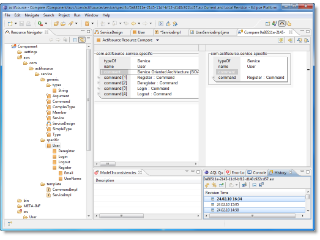 Actifsource constantly validates your templates against the backing models and makes sure that all relationships among objects conform to each and every model definition. Errors are detected automatically and flagged on the fly, making it easy to work iteratively and correct mistakes as you go. Let Actifsource generate code automatically every time you save your template or use dedicated generator tasks to build your artifacts as needed. 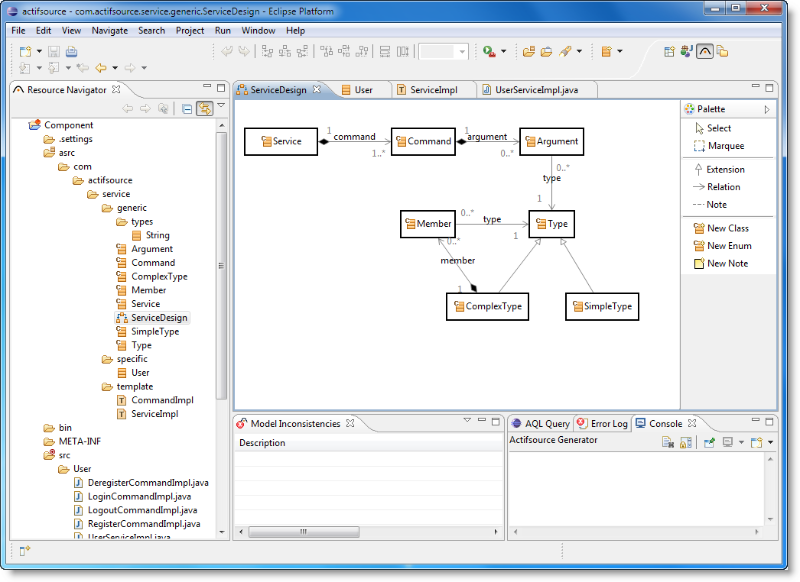 Feel free to change your models or generator templates anytime you want, let Actifsource help you change existing code and other artifacts safely and automatically, so all parts of your software conform to the actual concepts laid out in its architecture. Stop your code from degenerating slowly into an untangled mess and big ball of mud – evolve your software anytime! 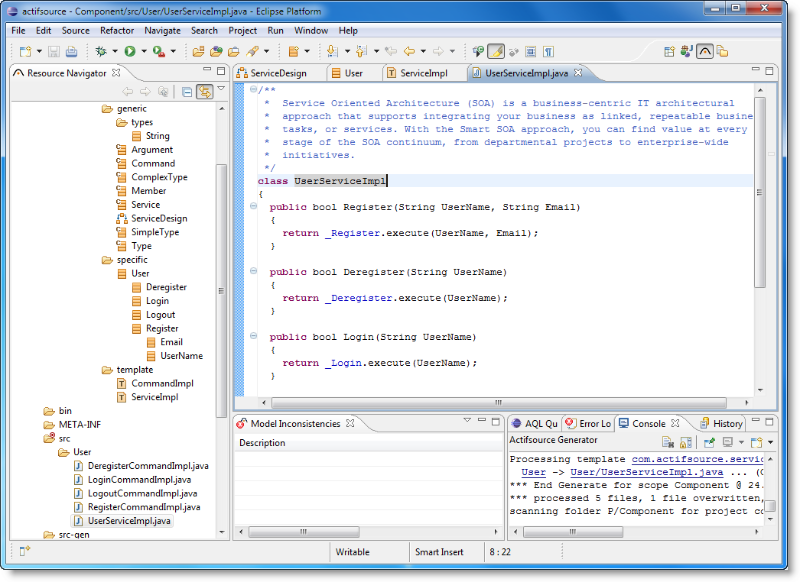 With Actifsource you can write generator-templates for any programing language. Actifsource ships with a number of predefined ready-to-use language syntax styles, so you get complete syntax-highlighting. Adding syntax highlighting for additional languages is easy and straight-forward. Don’t aim for the big shot at the beginning. Better start small and evolve, one tiny step after another. Start with any part of your system that can benefit from code generation. Don’t worry if at the beginning most of your existing code that was developed the traditional way is not backed by an explicit machine-readable model. Expand your knowledge over time, extract domain knowledge bit by bit from your existing code and build expressive models as you go. Then refactor your code into generic templates and use the existing code base as a reference implementation. Transform any legacy code into an asset again by turning the underlying concepts into expressive reusable models. Instead of reading through tons of documentation and training material, we believe any developer comfortable with Eclipse™ should be able to start profiting from code generation using Actifsource quickly and easily. Therefore, Actifsource fosters learning through exploration, allowing you to learn gradually the many ways Actifsource can help you and your team in building evolving software systems.